I don't know about you, but when I am dieting, it is really hard for me to skip the alcohol like most diets require. I understand why they require it, but there are just days and nights that I need a glass of wine or a mixed drink after a long day or to celebrate a special occasion! So if you are like me and want to stick to your diet without kicking alcohol completely then try out a bottle of Skinnygirl Cocktails! Skinnygirl Cocktails LLC was co-founded by Bethenny Frankel, renowned natural food chef, star of “Bethenny Ever After” and best-selling author, and David Kanbar, a successful entrepreneur with a long history in the spirits business. They know you want it all: the delicious taste of your favorite cocktails but without any of the high calorie guilt. You’re NOT willing to compromise and Skinnygirl doesn’t think you should have to. That’s why they’ve taken your favorite cocktails and made them low calorie with natural flavors, so you can have all of the fun and none of the guilt. It all started with the Skinnygirl Margarita but they have also added Skinnygirl™ Vodka with Natural Flavors, Skinnygirl® Ready to Serve Cocktails, and Skinnygirl™, the Wine Collection along the way. With all of them you’ll be getting a great tasting, naturally-sweetened, low-calorie option with each and every sip. The Tangerine Vodka and Island Coconut Vodka (both about 75 calories per 1.5 oz) were perfect for mixing with my favorite soda and the White Cranberry Cosmo and the White Peach Margarita (both about 35 calories per 1.5 oz) were ready to drink right from the bottle = DELICIOUS! So don't worry next time you are dieting (or if you are right now!). There is an alternative to cutting out alcohol completely = Skinnygirl Cocktails! You can drink them without guilt! 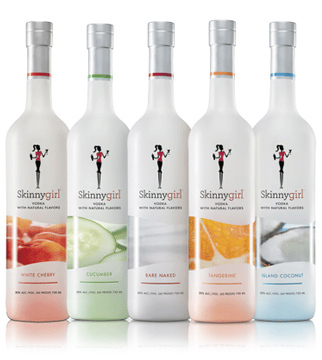 Buy It: You can purchase all Skinnygirl Cocktails at a local spirits retailer near you!